The Joint Base Andrews Branch Team, along with Oma George, Chief Retail Officer, pauses for a quick photo during the 459th ARW’s Family Fun Day. An afternoon of food and fun was provided for members of the 459th Air Refueling Wing Airmen and their families at Joint Base Andrews on October 15. 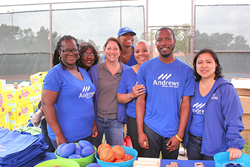 The wing held its annual Family Fun Day, sponsored by Andrews Federal Credit Union. The free afternoon event was filled with activities, including face painting, a moon bounce, an Instagram photo booth, balloon animals and more. A friendly, yet competitive, game of volleyball between service members highlighted the afternoon. Freshly grilled hamburgers and hot dogs, along with other delicious refreshments were also available to all in attendance. "Family Fun Day is a great way for our servicemembers and their families to celebrate what’s most important," said Oma George, Chief Retail Officer, Andrews Federal Credit Union. Andrews Federal Credit Union was founded in 1948 to serve the needs of military and civilian personnel by providing a vast array of financial products and services. With over $1.5 billion in assets, Andrews Federal has grown to serve more than 120,000 members in the District of Columbia, Joint Base Andrews (MD), Springfield, Virginia (VA), Joint Base McGuire-Dix-Lakehurst (NJ), and military installations in central Germany, Belgium, and the Netherlands. In addition, the Credit Union serves as a financial partner with many select employee groups in Maryland, the District of Columbia, Virginia and New Jersey.